There are a variety of ways to use a wine pull as a fundraiser. Murad Auctions has used wine pulls to provide fun revenue generating activities at various fundraising events. 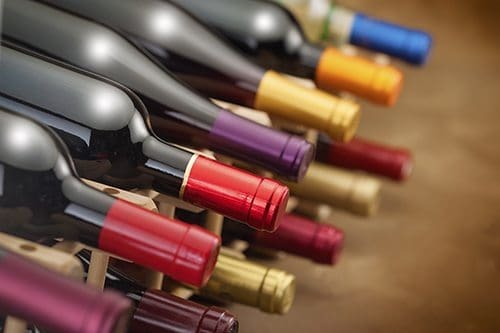 Refer to our previous blogs to learn how to get wine donated for your wine pull and the basics of how a wine pull works. The standard way to play a wine pull is to ask your guests to pay $25 per pull. Each bottle of wine is worth at least $25, so they are guaranteed to get something worth the amount they paid. You may include a few bottles that are worth $50 or $100 dollars to add some excitement. Give a blinking light, ring or pin to each purchaser to wear to attract new players. When other patrons ask how they got the blinking light, ring or pin, they will tell them about the wine pull and direct them to the wine pull table. Let’s focus on some ways to add a new twist to your wine pull. Dress up the bottles to go along with your theme. 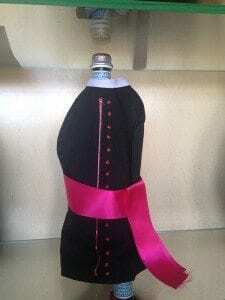 A seminarian event asked the woman’s auxiliary to make vestments for their bottles of wine. 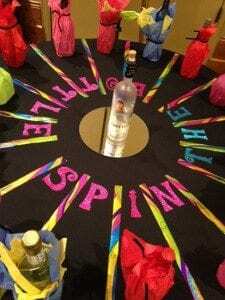 A 60s themed event used tie dyed tissue paper or fabric to wrap the wine. 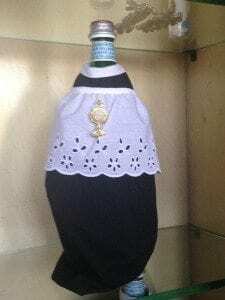 A black tie event dressed up their bottles in black and white tuxedos. Make it fun, but watch your budget. Don’t over spend making the bottles look fabulous. The idea is to make money on this! At a recent event I attended, wine bottles were dressed in newspaper print and the tops were shredded to look festive. It looked great and cost them nothing! Remember Spin the Bottle from your teenage years? Recreate the game using your wine bottles! Enter the game for $25 and spin! The bottle stops and you get the wine it is pointing to! To play the Ring Toss game, set up the wine bottles and let the guests buy 3 rings for $10. They get a chance to ring their bottle. Some guests may not win and some may win multiple bottles. Play Bingo! Allow guests to spin the bingo number basket and number the bottles. Whichever number comes out corresponds to their bottle of wine. Spin the Wheel Game allows guests to pay $20 for a wine pull or $30 for a wine pull and a chance to spin the wheel. After the purchases have been made, keep guests’ wine in boxes and number them by bidder number. This way, your guests don’t have to carry their bottles around all night. They can come by the wine pull table at the end of the night to pick up their bottles. Don’t take cash or checks when selling the wine pull chances. If you pre-scanned credit card as guests checked in, you will just need to collect bidder numbers on a multi-sale bid sheet to sell the items. It is quick and simple and gives you a clear way to reconcile your sales. Learn more about how to automate your check in and checkout. As professional charity auctioneers, Murad Auctions organizes and manages successful, profitable fundraising auctions for non-profit organizations in Dallas, Fort Worth and other cities across the U.S. We use our expertise, knowledge of the auction industry, new and creative auction ideas, and our effective and efficient procedures to host auctions that are so effective they often break records and exceed goals. We offer a variety of auction services to help make charity fundraisers successful, including live auctions, bid spotters, auction consulting, registration services, silent auction set up, auction solicitation services, and professional event planning.